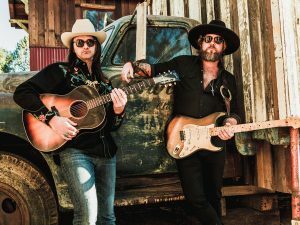 The Allman Betts Band will perform at The Stanley Theater in Utica on Saturday, June 15th at 7:30 p.m. as a part of their 2019 tour. After a successful year touring as The Devon Allman Project with special guest Duane Betts, the sons of Gregg Allman and Dickey Betts are joining forces to form The Allman Betts Band. They are releasing a new Allman Betts Band album and their worldwide tour will feature new music, songs from their solo projects and classic Allman Brothers and Gregg Allman tunes in honor of the 50th Anniversary of The Allman Brothers Band. The new album, slated for release in the Spring of 2019, will be recorded at the legendary Muscle Shoals Sound Studios. Former Allman Brothers Band keyboardist and current Rolling Stones keyboardist, Chuck Leveall, will guest on the record. The new Allman Betts Band includes Devon Allman, Duane Betts, Berry Oakley Jr. (son of original Allman Brothers Band bassist Berry Oakley), Johnny Stachela (slide guitar) and The Devon Allman Project percussionists R. Scott Bryan (Sheryl Crow) and John Lum. The Allman Betts Band will launch a world tour in March and perform throughout 2019 at festivals, theaters, including The Stanley Theater, and historic venues. Reserved seat tickets start at just $28 and will be available starting this Thursday February 14th for Stanley Members and on sale to the public this Friday February15th. Additional service charges may apply. To purchase tickets come down to the Stanley Theater box office Monday through Friday from 10:00a.m.-4: 00 p.m., give us a call at (315) 724-4000 or go to Ticketmaster.com. For more information, visit TheStanley.org.